Student activists at Dalhousie University made a permanent statement about climate change on Monday. 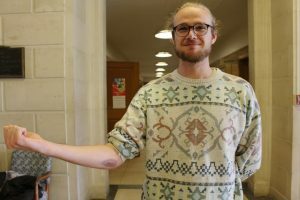 Fifteen students had three-digit numbers tattooed on their bodies — ink they are referring to as “birthmarks.” The numbers represent the amount of carbon in the atmosphere in the year they were born. Carbon concentration is measured in parts per million (PPM). Climate scientists agree 350 PPM is the limit for a safe climate. This year, the global carbon concentration passed 400 PPM. Alex Coley with his “birthmark” tattoo. Stick-and-poke artist Mia Feldbruegge, who is also a student, volunteered her time to do the tattoo work. She spent around 20 minutes on each person. Mills said way more students signed up for tattoos than the organizers expected. “We have so many people who want a tattoo that we can’t do everyone in one day. We’ve been blown away by the response to this,” she said. Divest Dal is planning a second event to fulfill the requests. Artist Mia Feldbruegge tattooing student Laura Cutmore. The organizers also drew Sharpie numbers on anyone who wanted to participate but did not want permanent ink. The event took place in the same building as Dalhousie president Richard Florizone’s office. Divest Dal members offered Florizone a Sharpie tattoo when he walked by the group Monday afternoon, but he declined. Since 2013, Divest Dal has been calling on the university to remove its investments in the fossil fuel industry and redirect the money into sustainable industries. Dalhousie’s board of governors voted against a proposal to divest from fossil fuels in 2014. The fight against fossil fuels is a global movement. 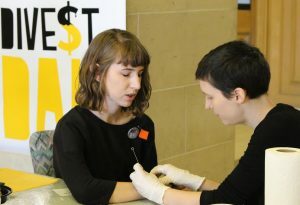 Monday’s tattoo event was inspired by a similar protest inside London’s Tate Britain gallery in 2015, where 35 climate change activists received tattoos before UN climate talks in Paris.